Philips are a very popular brand in the UK. 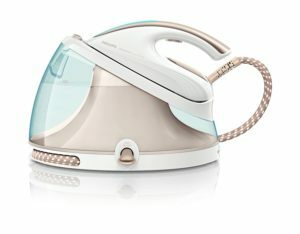 They make a range of household products that include lighting, sound and vision, child care, computer and kitchen merchandise. The Philips brand have been making irons for many years, so their move into the steam generator market, was simply a natural extension of their product range. Here we review the best of their irons in our top 10 table. Philips are based in Guildford, Surrey, England. They are part of Royal Philips of the Netherlands. Both are in the price range of £100-300 depending on which model that you decide to go for. Below we have listed what is currently available in the market, and at the moment they have 18 individual irons in their range. We have then reviewed which of these we believe to be the best. *These are average prices and may not always be current and accurate. These change frequently based on availability, special promotions, and more. Please be sure to double-check the actual price before buying. Please also note that the ratings used are averages and are based out of a maximum score of 100%. These can also change so make sure to check at the time of purchase. The table above sorts these out by ratings and by which ones we believe to be the best in the Philips range of products. This is probably one of the very best models available in the UK market right now. This one costs around £250 but has an extremely high rating of 4.8 out of 5 stars. 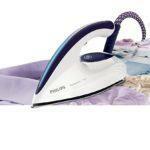 This one boosts a full 6 bars of pressure for amazingly fast ironing results. 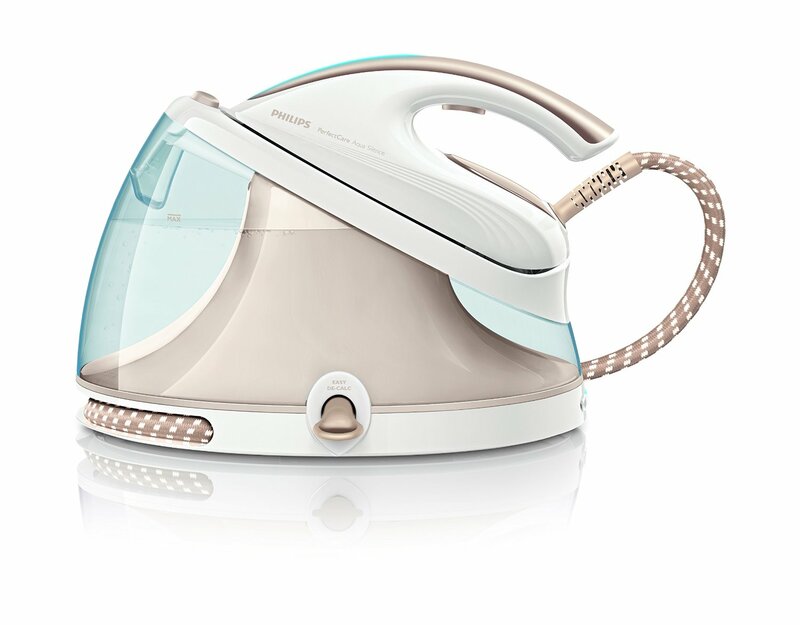 You get a full 120 grams of steam per minute, more than enough to deal with any stubborn creases. This model uses a 1.5 litre detachable water tank, with an extra wide spout, and can be refilled at any time. It also comes with a carry lock for safe and easy transportation. Buyers simply love this iron. This one remains their best seller and is the most popular in their range. It has an average price of around £100-110 depending on where you make your actual purchase. 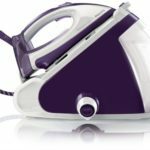 Over at Amazon there are well over 200 buyer reviews who have given this iron an average rating of 4.4 out of 5 stars which is very good indeed. This is a popular choice for many people and is at the lower end of the price point for these types of irons. This one is about 40% smaller than most of these types of irons, and that helps reduce the weight of it and also makes it a lot easier to store away. This one is in their SpeedCare range and as such is a lot cheaper and you should be able to pick this one up for around the £75 price point. Again at Amazon there are over 100 reviews and this one gets an average rating of 4.3, so again a really nice product of good quality and well liked by those who have bought it. 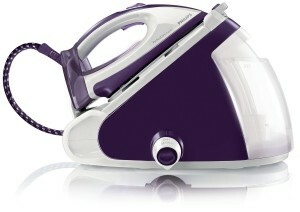 This would be classed as a budget iron for this type of product. Buyers really do seem to like this one though and for the value for money price it does perform pretty well. 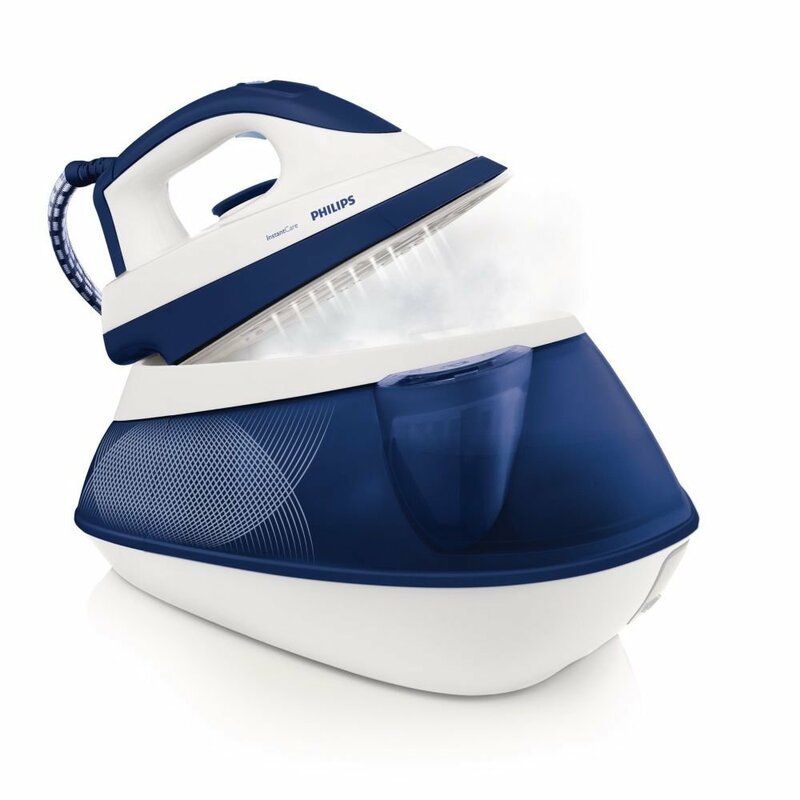 This iron is about 40% smaller than a typical steam generating iron so ideal for those stuck for storage space. 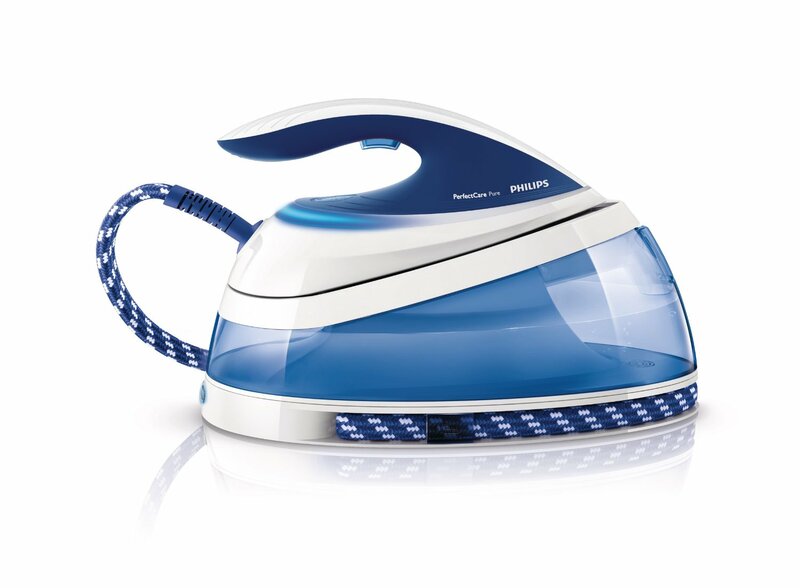 This is one of the leading irons in the Philips range. It is at the higher end of the price point but it has some very interesting features. 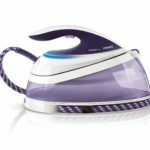 These have been designed to make your ironing a great deal easier. The one that I like the best is that there is no need to worry about settings. 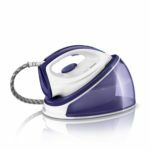 This iron has technology built right into it, that allows you to iron any material, without ever having to change, or even think about which setting it needs to be on. 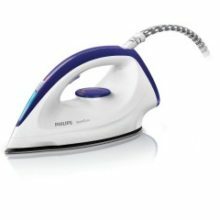 Overall this iron attracts a very consistent rating of 4.6 out of 5 stars, which is a very good rating indeed. Click Here to Read a More Detailed Review. Coming in at fourth on our list is this model. This one has reached the 150+ review mark and buyers rate this one slightly higher than the previous one with an average 4.3 rating which is really good and very consistent and solid. The price point is a little higher on this product and starting to get expensive at around an average £140. It is a very good iron. 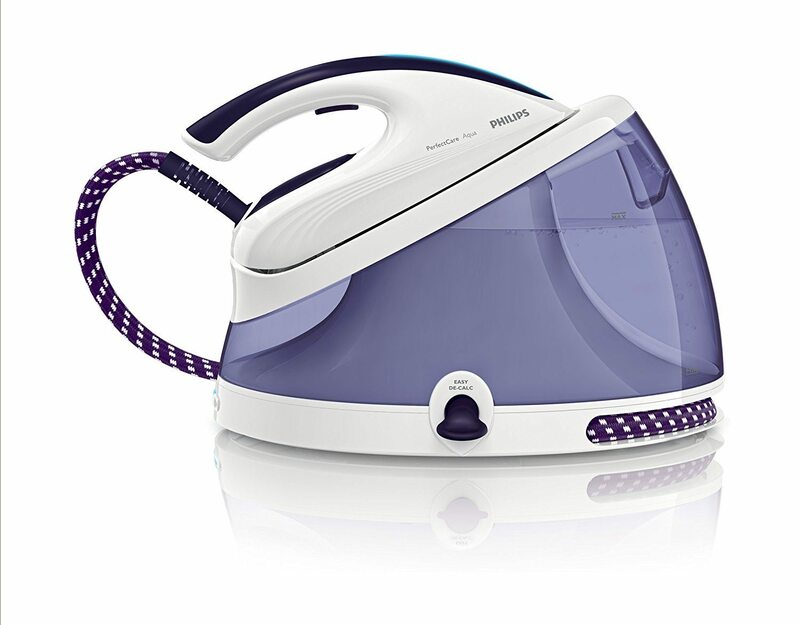 Buyers like this one as it has a huge 2.5 litre water tank, and that can give you a lot of hours of ironing. This product sells on a regular basis, and is popular with buyers. Click here to read my detailed review of the Philips GC8616/30 steam generating iron. 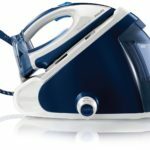 This iron costs on average around £165 and has a pretty impressive rating of 4.5 out of 5 stars. Clearly it is well liked by buyers. 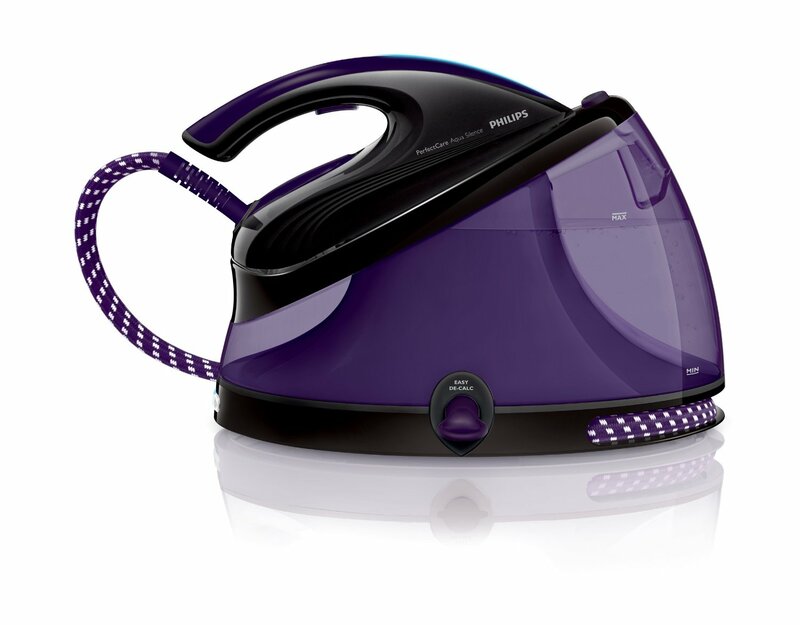 This model has a huge 2.5 litre detachable water tank and uses 2,400 watts of power. As you can see from the image, this is a very nice looking and high quality machine. 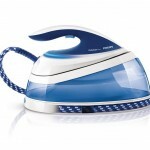 It has an impressive 5 bars of pressure and can generate a full 120 grams of steam per minute. That is certainly impressive, and it also includes an automatic shut off, and other safety features. You can click here to read a more detailed review. Like the one above, this one also costs in and around the £150 price point, and is slightly lower rated at 4.3 out of 5 stars. It is however still a very good rating to achieve. Based on the many buyer reviews, this remains a very popular choice for many people. This one is ready to go in 2 minutes, thanks to a fast start-up and comes with a 2 year guarantee. 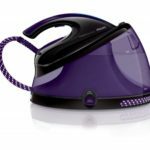 It is powered by 2,400 watts, produces 120 grams per minute of steam. This one has the smaller one litre tank, which is good for about 3-4 hours of ironing without needing to be filled again. This one is particularly good for those who like to use vertical steaming, on items like bed sheets, curtains and other larger garments. This model is highly rated and buyers have given this one an average rating of 4.5 out of 5 stars. This one does cost more and the average price available on this one is around £200. 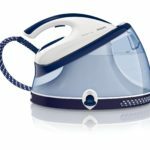 This is a fully pressurised steam generating iron, and can produce 120 grams of steam per minute, and also has a 300 gram shot burst of steam for the really troublesome wrinkles and creases. It has a 1.5 litre detachable tank and that is enough for about 5 hours of uninterrupted ironing. This model will cost you on average around £140 and it has attracted and maintained a 4.1 rating out of 5 stars. The unique thing about this particular model is that it is very easy to use. Like the others in this range it uses 2,400 watts of power. 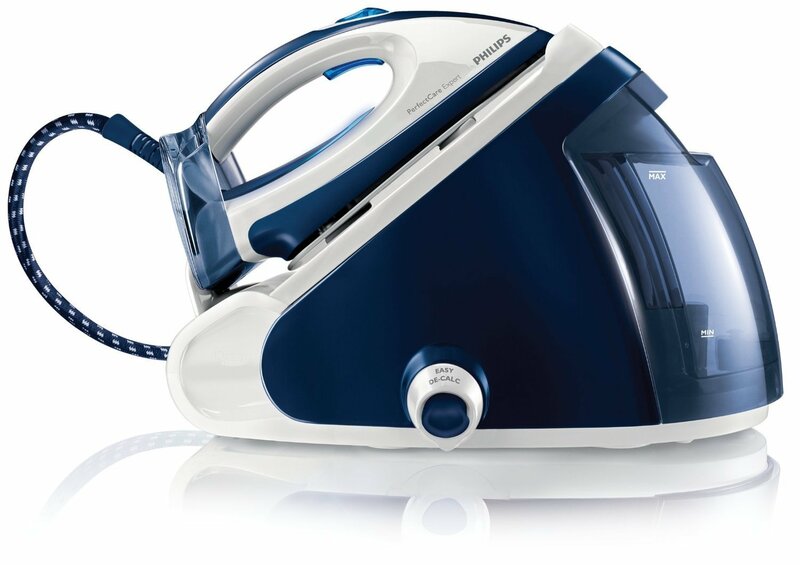 In this model you get a full 4.2 bars of pressure, and that helps deliver 120 grams of steam per minute. It is made from stainless steel and weighs around 3.2 Kg. This is a light and compact iron and ideal for those who have limited storage space. This one is quite expensive at around £220 depending on where you buy it. However it really does sell a lot and overall it has achieved and maintained a high rating of 4.3 out of 5 stars. So despite the high price point, buyers clearly like this particular model from Philips. 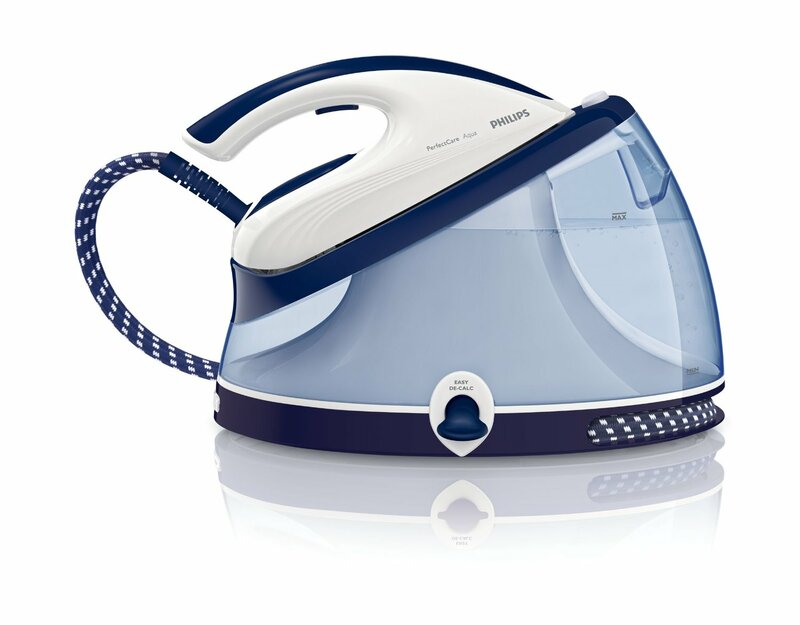 This one has a huge 2.5 litre detachable water tank which means around 7-8 hours of uninterrupted ironing. 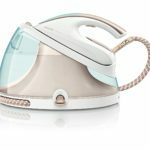 The pressure this one uses is very high at 6.2 bars and delivers a serious amount of steam, that can easily deal with any stubborn wrinkles or creases.